Ultima Thule: Oceans suddenly cool -- but will cooler heads ensue? Oceans suddenly cool -- but will cooler heads ensue? Perhaps hoping to be the first to undo the old adage that says everyone complains about the weather but no one does anything about it -- Al Gore would have you believe you CAN do something about global warming. Yes, folks, your good friends the environmentalists have taken their own hubris to such heights that they actually think THEY are in charge of the global climate and can change it at a whim, or at least at the mere purchase of a hybrid vehicle or remaining on the politically correct sided of carbon neutrality. But as this article attests, the ways of Mother Nature, and particularly of the climate, are still a mystery to even the most knowledgeable experts and do not pay a bit of attention to climate models or dire predictions. New studies show that the oceans are cooling and no one understands why. That is one reason perhaps that the hurricane season in the Atlantic has been so unusually quiet so far this year. Perhaps also last year's hurricanes drained off a lot of heat from the oceans. 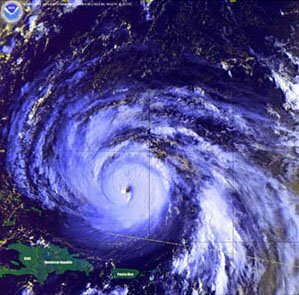 Hurricanes are one of the most powerful engines of heat transfer known. For years now, we have been deluged with the news that the earth's oceans are warming as a result of atmospheric changes due to the combustion of fossil fuels. Typical of these was a 2005 story titled "Where's The Heat? Think Deep Blue," from United Press International, describing a recent paper in Science by NASA climate modeler James Hansen. UPI's "Space Daily" wrote that "Over the past ten years, the heat content of the ocean has grown dramatically." Hansen's study covered more than just the ocean surface temperature, which can fluctuate considerably from year to year. Rather, by considering a much deeper layer of water (the top 2,500 feet), Hansen actually calculated the increasing amount of heat being stored. According to the UPI story, this provided "a match" with computer model projections of global warming. The ocean is a huge tub that integrates and stores long-term climate changes. Consequently, when computer models are based on ever-increasing atmospheric concentrations of carbon dioxide, the deep oceans warm, warm, and warm. Like a big pot on a small burner, it takes time to start up, but once the process starts, nothing should be able to stop it. That's the conventional wisdom of our climate models, but like the conventional wisdom on so many other aspects of life, it's not true to nature. In the next few weeks, John Lyman of the National Oceanic and Atmospheric Administration will publish a paper in the refereed journal Geophysical Research Letters showing that, globally, the top 2,500 feet of the ocean lost a tremendous amount of heat between 2003 and 2005 -- in fact, about 20% of all the heat gained in the last half-century. Needless to say, Lyman's figures have climate scientists scratching their heads. No computer model predicts such behavior. And further, the changes in surface temperatures haven't corresponded (yet?) to the average changes at depth, although deep-water temperatures have also dropped some. Nor has the sea level dropped by an amount commensurate with the cooling (water volume varies slightly with temperature). [...]But that's just another climate change hypothesis that time will test. Be forewarned, though. As we've learned from the completely unexpected cooling of the deep ocean that began in 2003, we know a lot less about climate change than we think. Patrick J. Michaels is senior fellow in environmental studies at the Cato Institute and author of Meltdown: The Predictable Distortion of Global Warming by Scientists, Politicians, and the Media. Fascinating! This fits with what Sally Baliunas argues; that any warming we have experienced was solar driven and that we have entered a cooling trend. The Earth`s albedo has increased (which was to be expected with a dropoff in solar output allowing more cosmic radiation to reach Earth) which would warm the atmosphere but not the oceans. With less energy being pumped into the oceans they would logically cool.